This week we will have more greens available… spinach, kale, mixed baby lettuce and Black Seeded Simpson (great lettuce for wilting). 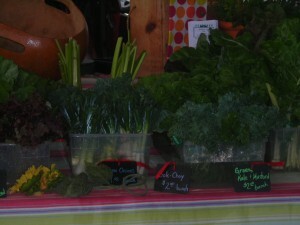 We will also have rhubarb, radishes and green onions this week. We have asparagus again this week, it was iffy due to the rain and colder temperatures last week. Kenny wants to get one more cut in if possible for next weekend, however, this may be the last cut of the season. We are now also cutting fresh mint and some cilantro. With all the great sales of herbs this year we are limited to the amount of rosemary and tarragon we will have available. We still have plenty of other fresh herbs and garden plants available. We will have basil, parsley, cilantro, dill, oregano, sage, thyme, stevia and mint. Kenny also has a nice variety of heirloom tomatoes, cherry tomatoes and some pepper plants. Thanks for supporting us with your purchases, and remember to visit other Floyd County vendors while at the market.